An ethnic community in Nepal's remotest Himalayan district, bordering Tibet, says it has been struggling to save its unique Buddhist culture from being uprooted by floods from a glacial lake. The locals of Halji village in Humla district of western Nepal practise the Drikung Kagyu school of Tibetan Buddhism, which has an 11th-Century monastery at its heart. They are very worried that the Rinchenling monastery - one of the oldest in Nepal and highly revered in Tibet - could be swept away or damaged by floods and mudslides caused by the outburst of a glacial lake on the mountain overlooking their village. For the past five years, Halji has been hit by glacial lake floods almost every summer and the last one, nearly two months ago, damaged two houses and swept away four horses. Several crop fields were washed away and many remain covered with sands, rendering them barren for many years to come. Villagers say the historic monastery now stands only around 15m away from the river bank that has been eroded by flood waters. They fear the next time the Tak Tsho lake bursts like it did this year, it may hit the 1,000 year-old sacred site. "It is our identity," said Kojuk Objang Tamang, the head of Halji village. "We cannot even imagine about our community without the monastery which is the base of our religious culture," he told the BBC. So strong is the community's belief in the monastery that they are convinced that it has saved them from the floods and mudslides so far. "It is because of the blessings of the monastery that the village is hit by floods at day time only and so there is no loss of human lives because we can run to safety during daylight," said Mr Tamang. "Had it happened in the night when we were asleep, God knows how many of us would have been dead by now. Astrid Hovden of the University of Oslo, who has been conducting her PhD research in Halji, has witnessed how central the monastery is to the community of around 100 households. "At the night of the flood (last June), after the water level in the river started to get back to normal, the monks performed an elaborate ritual in the monastery to pray for the safety of their village. "Since the villagers became aware of the problem, they have invited important lamas (priests) from outside to perform rituals to protect their village." Prayers apart, the villagers have also done whatever they could to save the monastery and their settlement. Although almost all of them are uneducated, they have knocked on the doors of the prime minister's office in the capital Kathmandu, the local authority and the national planning commission. Those efforts had secured some funding, which they used to build defences using rocks and gabion wires to tame the flood waters. "Every family in our village worked free of cost for the construction of those infrastructures," says Tamang. But villagers say that every year, the floods and mudslides hurtling down from the glacial lake - at a height of around 5,300m on the Gurla Mandhata mountain - become increasingly dangerous. "Our effort to save the village is proving to be no match for the force of the floods," said Mangal Lama, a social worker from the region. Mr Lama and other locals said they hiked up to the area where the Tak Tsho lake is located and found that it is hidden behind a hanging glacier. "We saw huge cracks on the glacier, and that explained why we used to hear big sounds around the same time in June every year before we were hit by floods. "Apparently, it appears that the huge pieces of ice sheet from the cracked parts of the glacier might have fallen into the glacial lake which then overflowed, causing floods and mudslides downstream." Some scientists say climate change has accelerated glacial meltdown in the Himalayas, creating many new glacial lakes and filling up existing ones to dangerous levels. Most of the 4,000 or so glaciers and their lakes in the Nepalese Himalayas are not monitored, like the one above Halji in Humla district. Nepal's National Adaptation Programme of Action, prepared under the United Nations climate convention, has rated the district's vulnerability to glacial lake outburst flood as "very low" - something which has been disputed. Mr Lama said some villagers are so frustrated that they are considering going to Tibet across the border to become refugees. "It takes five days walk to reach the nearest local authority of Nepal while Taklakot (the nearest Tibetan market) is only 12 hours away and moreover the villagers speak the Tibetan language and follow all traditions of Tibet." Locals say they cannot move the monastery and their settlement to a safe place. 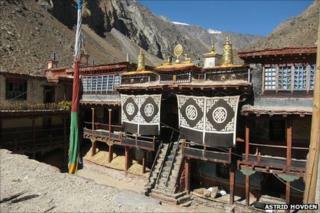 "The moment we move the monastery, its religious and historic value will drop to zero," says Tamang. "And that, in turn, means our century-old intact religious and cultural community will break and it will all be over."